As with most things, if you don’t use it, you lose it. Marine batteries which are not regularly used, not properly winterized or do not make use of a drip charging system lose their charge. If you’re lucky, you’ll be able to either jump start the battery and let the alternator charge the system, or you’ll more than likely have to replace the battery. The normal life span of a marine battery is about 5-8 years, but this depends on a number of factors we will discuss later down the page. Many are turning to marine solar panels, or wind generators in combination with trickle chargers to help prolong the life of their batteries. 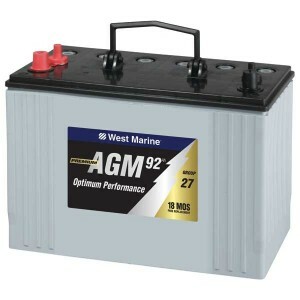 Because of this growing need to find discount batteries, we have put together a comprehensive comparison & reviews of the top rated marine batteries. What Makes the Best Marine Battery? 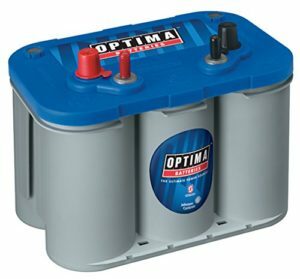 When it comes to choosing the top boat battery there are a couple of options to choose from. There are also a lot of factors to consider like the chemistry, size and characteristics. There is also the price and the maintenance factor that lets you decide which battery to purchase. But most importantly you should choose a marine battery by its performance and reliability. You never want to get yourself stuck out on the water with a dead battery. We’ve done it, and lets just say, it is not fun! So, which among the choices are best for your boat? Among the handful of choices, we have shortlisted the most reliable and high performance batteries available in the market today. Will it be used solely as a marine battery or as a trolling motor battery as well? How often will you use the boat? How many additional electronics are you trying to power? Will you have a marine power distribution block? Will you have a multiple marine battery bank? Do you plan to regularly charge the battery or do you want a one time, set it and forget it battery? All of the above questions should be answered when choosing a marine battery. Let’s face it, many of these power choices can cost several hundreds of dollars, therefore, its worth spending a little extra time ensuring you make the right choice. 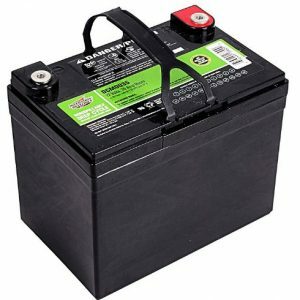 There are deep cycle batteries, which can be drained extensively before becoming damaged, cranking batteries which provide a sudden burst of power to get your boat and all electronics started quickly, and dual purpose batteries that can fulfill both needs without needing to switch from one to another. The weight of your battery will be an issue every time that you take it out of the boat for charging. If you carry several batteries on board as spares, your boat will be weighed down. If you are carrying large batteries, you will have less space on board for yourself and others. Choose a battery that is small and compact but packed with power if you are on a small boat. In the world of batteries, the more you spend, usually the better quality it will be. However, that does not mean that there are not any quality batteries available that you can afford. The thing with paying more is often that you will get a longer warranty by spending more. You may also get more cranking amps and more of a battery reserve capacity. The warranty protects your investment. The longer warranty you have, the longer you can go without worrying about your battery and avoid the expense of buying another. It is also a great way to see how well the manufacturer feels your new battery will perform over the years. In the marine environment, your battery not only has to provide power for a long period of time without recharging, but has to be able to hold up against the marine environment. A good vibration resistance rating means that your battery will not have internal parts that become damaged easily by the vibration that boat batteries must constantly endure. You may not think about accessorizing your marine battery, but the truth is; you can. There are a lot of battery accessories that people feel are a quality investment in the marine environment. They include things like marine switches so you can swap from one battery to another with ease, battery boxes, battery trays, and extra terminals. You also need to make sure that the battery you are considering will work with your battery charger and any wires that you may already have in place. Technically, a battery is an electro-chemical device which converts chemical energy into electricity by galvanic cells. AGM (Absorbed Glass Mat) batteries are batteries which have a fine Boron Silicate glass mat which is advantageous for marine use since it will not leak acid. 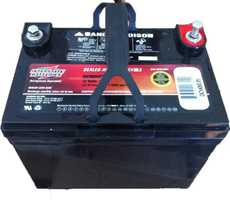 AGM batteries last about 4 to 8 years and are virtually maintenance free. They are completely sealed with pressure caps which make it safer for boat and marine use. 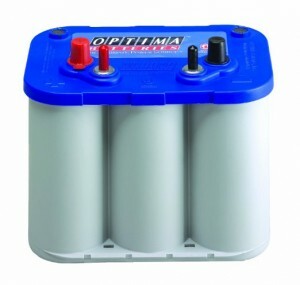 If your boat were to capsize (lets hope not), your batteries will turn upside down but won’t release any electrolytes. 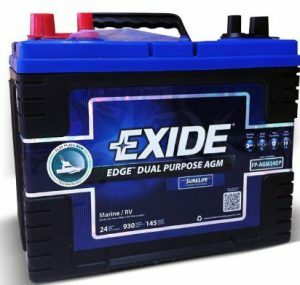 These are extremely reliable batteries for boat use. 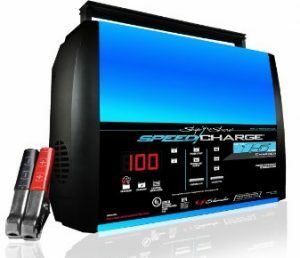 Deep cycle batteries are designed to store larger amounts of energy that discharges deeply and recharges repeatedly. It is designed to deliver a steady amount of power over a long period of time without any interruption or failure. They have thicker plates and are to be discharged up to 80% time after time. They also are built with a denser active material ratio so that you can have better cycling capacity. This is the latest and probably one of the most cutting edge batteries that are available on the market right now. Lithium marine batteries are significantly lighter than the AGM or the lead acid battery. They do not heat up when charging and are much faster to recharge. This battery has the technology of a power control board which prevents damage to the battery. Some features include automatic low voltage protection, short circuit protection, reverse polarity protection and charge balance. It is a green alternative to other batteries available for use. With this technology, this is practically maintenance free. 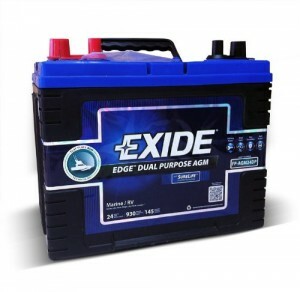 This type of marine battery is more expensive than the AGM or other Deep Cycle batteries but promise to give high performance, more safety, durability and deeper depth of charge. For the environmentally conscious individual, this is the best pick. It is highly recommended for use in Jet Ski, speed boats and yachts because of its compact size and weight ratio to stable voltage output. You can also use a couple of lithium batteries for larger vessels like trawler and cargo ships by connecting the batteries in either parallel or series connection. 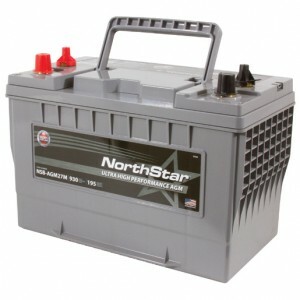 Read our full review of the NorthStar Thin Lead Marine Battery here. This means cleaning it from dirt and removing corrosions on the terminals. Because of weather, use and time, the terminals will have a chance to be corroded. You can use a wire brush post cleaner to remove the corrosion. This will help in extending the lifespan of the battery and the flow of electricity that your boat needs. For flooded deep cycle batteries make sure that you add enough distilled water. This is especially most important for sealed maintenance free batteries. You have to follow the correct number of hours for charging the battery. Recharge the battery immediately especially after storing it or not having been able to use your boat for a long time. Make sure that there are no bulges on the side and there are no cracks. If they do, you might have a problem with the alternator of your boat or your charger might be overcharging your batteries. Make sure to check the voltage of the battery to see if it has the right voltage. Make sure you put your battery on a trickle charge. Do not store without a charging device. Choose the right battery according to your needs and budget. Take care of your battery by properly maintaining and checking it. By doing this, you keep yourself from getting stranded like all too many of us have.